Home » Agriculture » 20,000 sigs Against Big Ag Leafy Green Marketing! 20,000 sigs Against Big Ag Leafy Green Marketing! 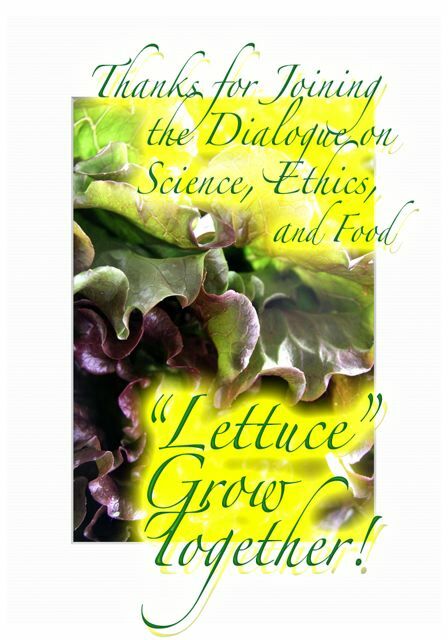 Posted by Leslie Goldman on Jul 26, 2011 in Agriculture, Food Safety | Comments Off on 20,000 sigs Against Big Ag Leafy Green Marketing! THIS STORY IS TIME DATED! and our Respected President Barack Obama. I appreciate the USDA wanting to help us have safer food, however this Green Leafy Marketing Agreement is ill advised if we truly want a healthy economy and better health for our people. Serious education is needed to return to an organic and sustainable lifestyle, each of us being an Organic Uprising, Standing Up for Nature’s Original Technology. I urge all involved to continue to make contact with the USDA, FDA, USDA Codex Office, and the President about these important issues that will only be resolved through an honest Dialogue on Science, Ethics, and Food. A serious reeducation is needed. I urge the AMS to drop these agreements. They will further lead us in a direction away from solving the inherent problem that we need many more local organic farmers, and less Big Ag monoculture centralized farms that are disease producers and contrary to the laws of nature. I sense that Big Ag, who wants this is threatened by more and more people supporting local organic farmers. They do not want to pay the price for the outbreaks of e coli and bacteria that come from a system of ag that cannot possibly work. Food is Sacred. It was not intended to make profit its primary purpose. We want Leafy Green Marketing Agreements that encourage nutrition per ace more than profit per acre. Be well, see you all on the Plant Your Dream Blog. Come visit us at the Hillcrest Farmers’ Market. Our farmers and shoppers will show you why we love good healthy food grown organically. Leslie Goldman, Your Enchanted Gardener, (L) That’s me! with Dave Murphy, a Giant of a Man Doing Good in the World. Photo from the Natural Product Expo West, March 11, 2011. Food Justice and Sacred Food for All People. National Green Leafy Marketing Agrement. in signing a petition to be delivered to USDA. Codex Alimentarius Commission that determines Food Rules. will be on the bad end of Trade Agreements. UN and World Health Organization. The CAC has a fascinating apparent time table. USDA Comment Receiving period for the NGLMA. by 5 PM EST on July 28, the movement to educate goes on. and Emotions a chance to make dreams come true. the Plant Your Dream Blog. to speak our minds on this issue before. with the links below in any case. and wanting to communicate with them. Secretary of Agriculture Tom Vilsack. the time frame of official input. that prefer big Ag approaches to food growing. On the contrary, today is the day to turn our beat around with nature. Standing Up for Nature’s Original Technology. sustainable living on a healthy planet. O.K. Team, All together now. Can you hear the calling out, Two Leggeds? Heathy organically grown Lettuce is talking loud and clear to us today. It refuses to lose this battle. There is a battle. in nutrition per acre than profit per acre. We have less than 48 hours to get this job done. Now is the day for an Organic Uprising. We the People, please speak up! already have enough red tape. They do not need more! Organic yesterday, today, and tomorrow. in remaking a true healthy earth-based American Dream. Please reinvest in American ideals. WHAT IS SO SPECIAL ABOUT JULY 29? the Impact of Leafy Green Marketing Agreements. more gardeners and farmers, not less. We are being called to be a nation of gardeners. This is essential if we want to return to true food safety. Today the USDA and Big Ag are conspiring to implement a set of rules that favor giant industrial growers while placing small, diversified farms at risk. Known as the National Leafy Green Marketing Agreement, this set of rules was designed by industrial growers to protect their market share while harming their main competition, the growing local and organic food movement. The Leafy Green agreement, drafted by the largest vegetable growers’ lobbyists in an effort to whitewash their growing food safety problems, would implement draconian practices that saddle farmers with one-size-fits-all rules and would drive local and organic farmers out of business with expensive regulations. Call these FDA phones and write. with us and give us a fair listening. would likely be arrested today for teaching that food heals. that is bringing our nation down. Let them know your opinion. for nutritious foods and supplements? is the vehicle that has been ‘carjacked’ by special interests. of return to sustainable living practices. NEEDS TO BE PUSHED BACK TODAY! Deadline is July 28, 2011!!!! In the verdant farmland surrounding Monterey Bay, a national marine sanctuary and one of the world’s biological jewels, scorched-earth strategies are being imposed on hundreds of thousands of acres in the quest for an antiseptic field of greens. And the scheme is about to go national. Invisible to a public that sees only the headlines of the latest food-safety scare – spinach, peppers and now cookie dough – ponds are being poisoned and bulldozed. Vegetation harboring pollinators and filtering storm runoff is being cleared. Fences and poison baits line wildlife corridors. Birds, frogs, mice and deer – and anything that shelters them – are caught in a raging battle in the Salinas Valley against E. coli O157:H7, a lethal, food-borne bacteria. What Washington knows about food has no ground from a beet’s point of view. The cornerstone of authentic food safety is first of all, growing some of your own food, and second, having a personal relationship with the farmers growing the rest of your food. This is an ideal. How many of us live in places like San Diego where we can grow food 12 months of the year and get to know more than 100 local farmers by name? At the bottom end of the scale of food growers are the micro farmers — small food growers — and everywhere now, from New York City to the West, people are returning to food growing. Micro farmers, in a truly healthy food safe economy need to be encouraged, yet currently they are falling between the cracks. For authentic food safety, we need more food growers, more gardeners and farmers, not less. We are being called to be a nation of gardeners. This is essential if we want to return to true food safety. Micro farmers and gardeners growing on less than a few acres live by other codes. They grow food that is labor intensive. The 15% of people who still micro-farm are part of that tradition. Modern conventional food and its PR are ensuring a growing climate in America that is not good for small growers. Take as an example the case of Barry Logan, who had a final harvest celebration September 18, 2010. 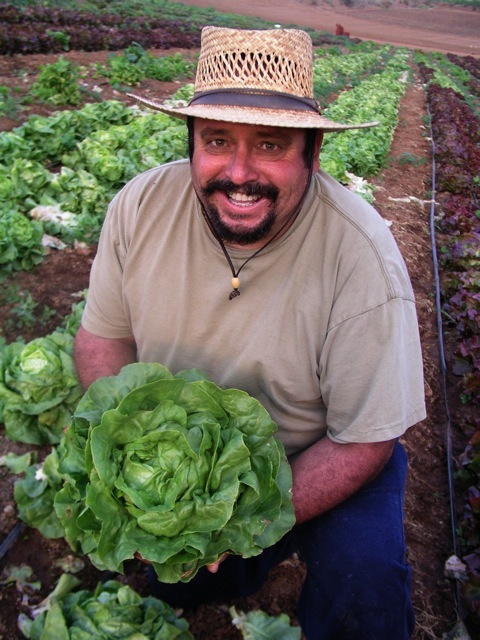 Barry Logan, with the help of his live-in community, served San Diego for seven years with fresh food. I am talking about food that can turn health around. He sold food at three farmers’ markets. His customers were his regulators. 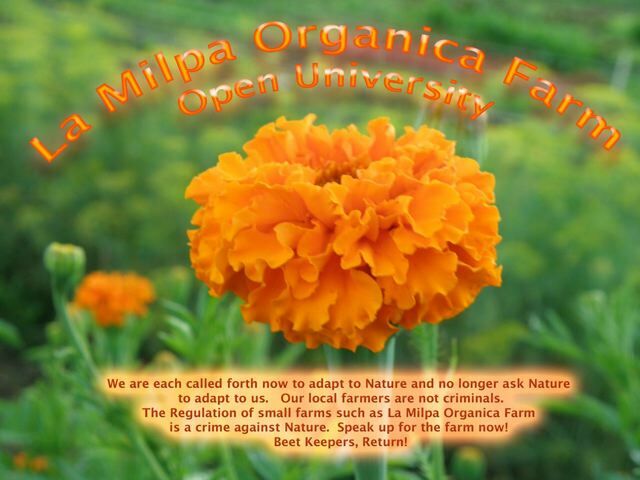 He had been running La Milpa Organica Farm as a social experiment, as an open university. He farmed on a small field, organically. His workers were from around the world. His customers became friends and he would invite them to the farm for potlucks and pizza each month. That life does not exist any more on that land. I called the USDA today. I was please with the conversation. our own worlds and need real dialogue on Science, Ethics, and Food. or that Washington is the enemy. I spent the day writing about this unexpectedly. This is a very important issue. I am sorry I just heard that this was coming up in the last few days. I have been studying and writing about this for a number of years. I am in support of the USDA, and FDA working with us to protect local organic farmers. This is the basis of a strong agricultural and economic future for our nation. As a consumer and a popular internet writer, I strongly oppose the National Leafy Green Marketing Agreement. I do agree that this agreement, that I have read about for two years is not the way to handle food safety. It is contrary to the laws of nature. That is why we are having problems with Food Safety in the first place. to some helpful employees, one who guided me to the Original Document in the Federal Register. I feel we all live in different worlds. Ethics, and Food. We will get somewhere. Get up the good job of wanting to do the right thing. Here is the initial Blog I wrote today. I appreciate many things that USDA does. and we need to sit down and talk. I stand by what I wrote here.